The Princess of Telendos NK 599 is the pride of Kalymnos and Telendos. The most comfortable and fastest multipassenger boat available. 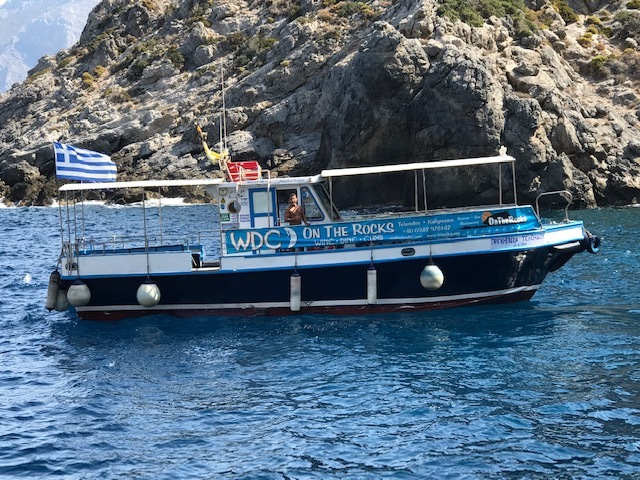 You can book the Princess of Telendos for traveling with larger groups to the climbing spots around Telendos or Kalymnos or just rent her for an amazing sunset cruise around Telendos. Or you are looking for the perfect venue for your wedding, then also the Princess is happy to accommodate you! The On The Rocks TK 189 is the Princess of Telendos small sister. Nimble and fast for the quick trip to the rocks on Telendos. Perfect for climbers and hikers. Boat rental and getting to the climbing sectors on Telendos or Kalymnos has never been easier on the islands!